If you've been there, done that, in Cabo San Lucas, and are looking for a different type of vacation experience, then you'll want to explore the cozy town of San Jose del Cabo. Although still having some nightlife and dining and other vacation experiences, it has retained it's quiet and peaceful lifestyle as well. We'll visit the La Playita native community and the new Puerto Los Cabos Marina, before exploring the charming town square of San Jose del Cabo, it's Mission, City Hall, Art Galleries, and more. You'll have some free time to explore on your own, as well as sample and taste different varieties of Tequila, the national drink of Mexico, and learn how it is made. We'll finish up with a lovely dinner at El Herradero, local Mexican and Seafood restaurant, and soak up the ambience of San Jose del Cabo. Want more flexibility? 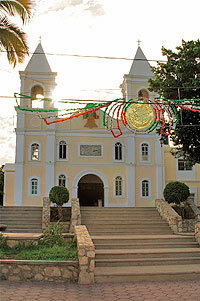 See our Private San Jose del Cabo for Cruise Passengers. Monday, Tuesday, Thursday, and Friday at 4:00 PM (winter) or 6:00 PM (spring and summer). Times are for fall/winter - 2 hours later for spring/summer. All Ages Welcome. Kids prices apply to ages 4-11 years. Kids under 4 are free. The nice thing about this tour is that it departs at 5:00 PM, so you can be out and about on the beach or doing another tour all day long, and still get to visit San Jose del Cabo, which maximizes your vacation time.